Cookouts and get-togethers are in full swing. While I love seeing family and friends, I always worry about the food being served. I’ve become such a finicky eater in the past few years that traditional summer fare doesn’t really appeal to me. The one nice thing, however, is that with my reputation of loving food, I can show up with any dish and no one gets offended that I brought food. In fact, I think it’s slightly expected. I always have a stock of grains in the cupboards ,cheese in the refrigerator, and produce from the CSA. 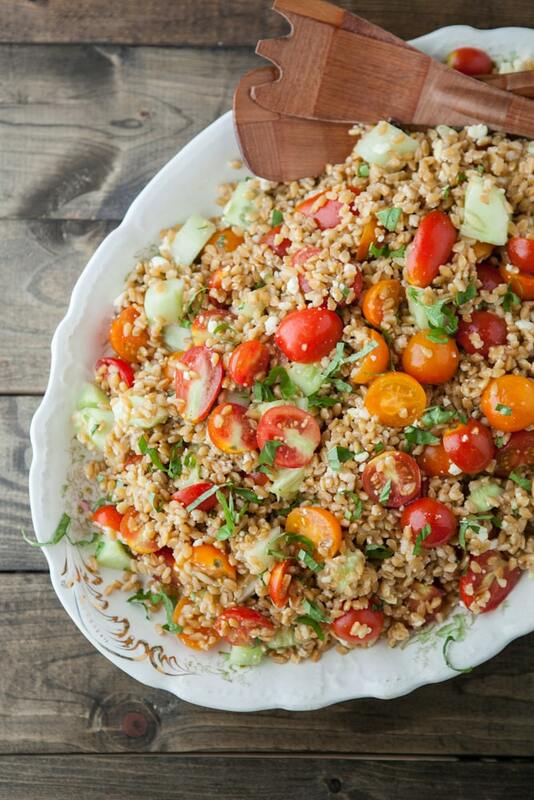 There are so many variations you can do with this summer farro salad just by changing out the grain, cheese, or veggies. A quick note about farro. For this recipe I actually farro piccolo (einkorn wheat) that can be found in some health food stores or online. Farro is actually a broad term for three different kinds of wheat and most farro purchased in the United States is the farro medio or emmer. Ancient Grains for Modern Meals is a great cookbook that has a small section on the difference between the three grains, I highly suggest you check it out! And on that note, I’m off to pack! Leaving for Colorado in the morning for a week full of running around in the woods and hiking! Have a great weekend! While I use tomatoes and cucumbers, you could really throw whatever you may have. Other ideas are broccoli, swiss chard, kale, or zucchini. Bring a large pot of water to a boil, add farro, and cook until tender; 15-20 minutes. When farro is done tender (it will still be slightly chewy) drain and place in a large serving bowl. 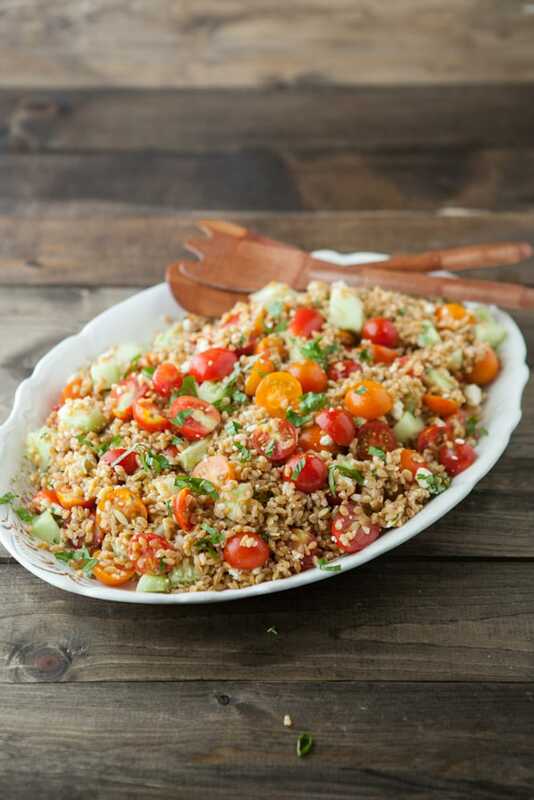 Cube cucumber and slice cherry tomatoes in half, toss with farro. Sprinkle feta on top. Whisk together olive oil, lemon juice, honey, and basil. Drizzle over salad and lightly toss until salad is coated. Let sit and chill slightly before serving. What a fantastic reputation to have! If you were coming over to my place, you’d always be welcome to bring a dish. Just made this, sooooo good! looks good! I have never had farro before, but how do you think it would be if I swapped it out for Quinoa? I think it would be just as lovely- I enjoy quinoa in these types of salads as well!